Tallinn is a fantastic place to party with so many pubs and bars located in such a tiny area, largely focused around the Old Town. Whilst it's true to say that the city attracts many English stag parties and Finnish booze cruisers, you can still avoid the rowdy drunk tourists with the more sophisticated bars listed below. Whilst obviously aimed at tourists, this medieval theme bar, built into one corner of the historic Town Hall, should be on everybody's list to visit when in Tallinn. Elaborately theatrical, "Kolmas Draakon" is a dark candlelit stone wall cellar where waitresses in medieval costume serve you tankards of ale and traditional Estonian schnapps with delicious elk soup, pies or jerky, whilst you fish for your own pickled gherkins from a huge barrel in the process. The bar belongs to the same people who run the famous medieval restaurant, Olde Hansa, just around the corner which is even more of a tourist trap. Open daily until midnight. This incredible wine shop, bar and restaurant in a cellar built into the medieval town wall, next to the stunning 1930's restaurant Gloria, must surely rank as one of the best in the world. With over 2000 wines to choose from, it claims to have the biggest collection in the Nordic countries. There is no menu, you basically buy a bottle from the wine store, which range from €5 for a glass of Hugel (one of our favourite wines in the whole world) to €85,000 for a bottle of Frapin Cuvee Francois Rabelais cognac. The incredibly beautiful rabbit warren of rooms are elegantly decorated with antique furniture and wine shelves, which cover the bare stone walls. Small dishes complement the wine perfectly however there's no pressure to dine if you're just here for the fine wines. You'll struggle to find many more romantic places to drink in Europe, let alone in Tallinn. Open until 23:00. Closed Sundays. KKA or "Tallinn Creative Hub Urban Garden", also known as PADA, is an incredible community venue that is open on summer nights until 04:00. You will find the entrance at Kalasadama 6, next to the huge derelict Power Station, which operated here from 1913–1979, and whose boiler room (from which the venue takes its name) hosts live events all year around. Think DJs, a jazz club, live music, makeshift bars, dance floors, table tennis, an open air art gallery, vegetarian cafe, ice cream stall, theatre performances and even a bike workshop. It all feels slightly grungy, like attending an illegal festival for 1,500 arty people and is somewhat reminiscent of Christiania in Copenhagen, Forte Prenestino in Rome, the ruin bars of Budapest, or hipster clubs of Berlin - except it's all ran by the city council. Originally opened during Soviet times by artists as a direct reaction to the city's Kuku bar, which had a strict door policy, this cool place to meet also required a membership card to get in. Nowadays, you can get through the beautiful red and blue painted door at no.5 Pikk Street by typing "8888" on the key pad. Once inside, you'll find three rooms of 1970s decor, vintage furniture and even an old 1980s computer. There's a decent selection of beers, ciders and liquors and it's a great place to spend time talking with friends. The appropriately named sky bar on the the 24th floor of the Radisson Blu Sky Hotel Tallinn is the place to sip creative cocktails and enjoy the stunning views 90 metres above the city's streets. The terrace lets you breathe in the fresh night air as you gaze out over the city. Slightly more expensive than other bars in town, it's worth paying the extra, especially on sunny days or warm nights. Open daily until midnight (02:00 on Thursday - Saturday). The beautiful wooden house that is home to this fantastic cocktail bar and restaurant dates back to 1872 when it was built for the Russian Market which stood on this spot since 1791. The pretty French villa-style with its tea-corners and main hall, spent time as a pharmacy, where a Sicilian lady with a shady background earned a small fortune selling her "manna" natural remedies (sugar extracted from an ash tree). The bar is named in her honour. Famous Estonian writer Oskar Luts lived and wrote many of his famous works here in 1908. Following the collapse of the USSR, it remained empty for 20 years before resurfacing as this eye catching quirky venue, where all the art and furniture is for sale. The food menu is devised by a Michelin Starred chef and the cocktails are arguably the best in town. Down a small alley in a sidestreet alongside the Niguliste art museum in the Old Town, you will find the permanently packed cave of the "Devil". This cellar-like real ale pub serves over 14 tap beers, the most in the city, ten of which are from Estonia, including four of their own brews. If that's not enough, there's over 130 bottles (50 from Estonia) and it's one of the only places in Tallinn where you will find the delicious but devilishly strong 7.6% ABV Pihtla beer from Saaremaa Island. Highly rated traditional Estonian food is available too. Closed Sunday. This colourful cocktail bar, which seems to be a magnet for all the best looking people in Tallinn, was opened by Heinar Õispuu and Kristo Tomingas, two of the highest rated bartenders in Estonia with over 50 international trophies between them, all on display behind the bar. Together with fantastic signature cocktails, there are DJs at weekends with musicians, singers and dancers as accompaniment until 03:00. Regular special events and live music every second Thursday of the month are also a big attraction. Closed Sundays. 20 minutes walk from the Old Town square (10 minutes from the station) and far away from the tourists, this friendly hipster hangout is located in Tallinn's beautiful Kalamaja neighbourhood, with its picturesque wooden houses dating back to the late 1800's. It's all very Soviet chic with a retro 1980s feel, provided by the vintage teacups and glasses, music selected by customers from an old suitcase of vinyl LPs, live musicians or by the bartender's YouTube disco. Try the Kurgijook cucumber liquor with its secret ingredient. To get the full feeling of going back to the 1980s, there's also a smoking room. Open later on Fridays and Saturdays, until 03:00. Closed Monday. In the really cool Telliskivi Loomelinnak Creative City - a former factory complex close to the main station which has been converted to a hub of bars, restaurants, galleries, stores and offices - amongst other distractions, you will find this amazing craft beer bar from James Ramsden, the British former supermarket worker credited for kickstarting Estonia's craft ale movement with his Drink Bar & Grill (below). "Bottle Bar" has ten ales on tap and more than 200 other rare bottles from around the globe, try the 5 beer flight to the rumbling noise of the never-ending late night trains rolling past outside, transporting a different kind of oil from Siberia. 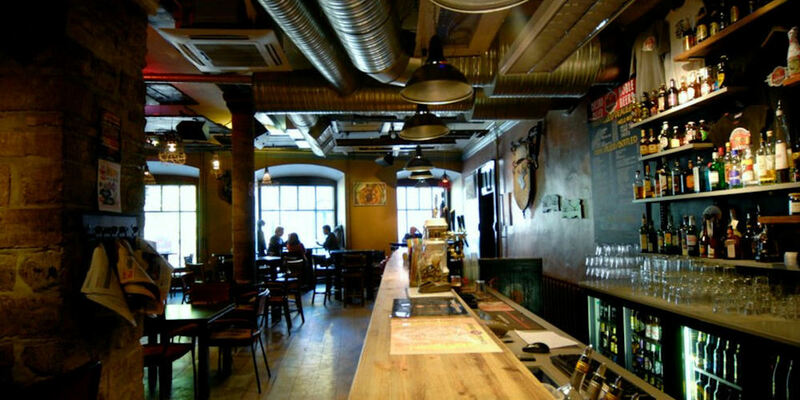 This beautiful "beer club" is located on the famous Pikk street in Tallinn's Old Town. Ancient architecture and modern design sit side by side making it a sophisticated place to watch the football whilst sampling the 47 different types of beer on offer, seven of them on draft and six brewed in house. Try the Taste Selection flight to sample all six. There's also a good choice of cocktails, liquors, shots and over 100 wines, all enjoyed with a soundtrack of jazz and blues. Open Sunday - Wednesday until 01:00; Thursday - Saturday till 03:00. Named after the headmaster in Anton Hansen Tammsaare's 1926 novel "Truth and Justice", this atmospheric pub with a great beer list is well hidden in a cellar below the Tallinna Keskraamatukogu (Central Library), which is housed in the former "Russian Club", dating back to 1895. You will find it on the right hand side of the beautiful pink library building at Estonia Pst.8. The cellar acted as a bomb shelter in WWII for the librarians, however nowadays you'll find low lit exposed brick walls, red leather sofas, bookshelves, literature references and plenty of students, all reminding you that you're basically drinking in a library. Open every day. Close to Pudel Baar (above) in the cool Telliskivi Loomelinnak Creative City near to the main station, you will find "F-Block", an all-in-one family-friendly canteen restaurant, bar and events space. Located in an imposing 100 year old industrial building, it's so popular, you'll need to book ahead for a table. 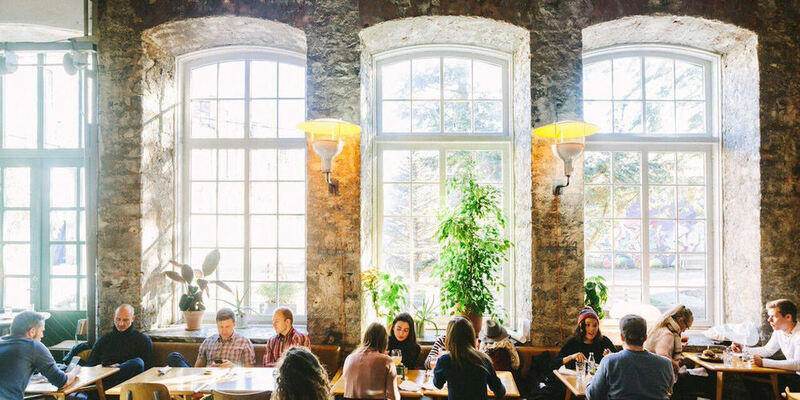 In saying that, drinks at the bar or on the terrace outside in the old factory yard are usually possible however, and with a huge craft beer and liquor list, it should still be on your Tallinn bar crawl even if you're not dining. Check their Facebook page for occasional club nights. This informal wine bar takes away all the usual snobbery that is usually associated with such places. Instead you will find a friendly homely hangout with cheap wines, occasional DJs and fun wine tasting evenings. Despite the low prices, the wines are still high quality with over 50 bottles to choose from, almost half of which are available by the glass. Famous names like Masi Riserva Costasera, Damilano Lecinquevigne Barolo, Mastroberadino Radici Tauras, Chateau Mont-Redon Chateauneuf-du-Pape, Pasquier Desvignes Chablis, Arthur Metz Riesling and Valckenberg Eiswein are, more than likely, even cheaper here than what you'd pay at wholesale back home. There's a decent beer selection too. Busy every day, it serves as a popular pre-club warm up bar despite being open late (05:00 at weekends). On Fridays and Saturdays from 23:00 until 05:00, this former bank on the edge of the Old Town transforms to an elegant club where seemingly all of Tallinn's most beautiful and best dressed people like to drink cocktails and party to House DJs accompanied by dancers, acrobats, musicians and vocalists. Entry is for over 21's only and costs €10+ (girls get free entry before midnight), whereas a VIP ticket for €20+ gets you a welcome drink and access to the intimate Moet VIP (R'n'B) Room and Hendrick's Rooms. No photographs. Tallinn has no shortage of cigar shops and smoking lounges, however the "Davidoff Cigar House" is arguably the best to visit as it's located in an old elegant 16th Century building, accessed through a narrow shop front to the right of the Troika restaurant on the Town Hall Square. Away from the heaving crowds of tourists out front, you're almost transported to a Victorian London Gentleman's Club with a spacious exposed brick wall room, stuffed leather armchairs, and a beautiful fireplace making it the perfect place to sip on a cognac or whisky, smoke a Davidoff and discuss politics. As you would expect, the clientelle are older and more refined. Open Monday - Saturday from 11:00 until 01:00 and until 16:00 on Sundays. Long before the craft ale boom hit Tallinn, this brewpub had been creating its own seven "living" non-filtered and unpasteurized beers on site since 2002. Using only high quality raw materials with Austrian malt and German yeast and hops, it remained the only unique restaurant-brewery in Estonia for many years. Tourist heavy, they boast the longest summer terrace in the Old Town whilst the interior is less medieval Tallinn and more typical of Vienna, recreating the style of an Austrian bierkeller. The beers nod more to Germany, using traditional 16th Century Bavarian recipes overseen by Austrian-qualified Master Brewer Eve Toomela. Try the tasting flight for all seven. Long before he opened Pudel Baar (above), Brit James Ramsden introduced Tallinn to craft ales with this tiny street corner beer shop and bar in the Old Town. At a time when the foreign owned, mass produced Saku, A. Le Coq and Viru Õlu were the only Estonian beers available, his popular venue was a game changer, introducing the locals to hundreds of international small scale brews. Today, thanks to his influence, there's plenty of small Estonian representatives amongst the 100 bottles and 13 taps, including local brewers Põhjala, Tanker, Ollenaut, Lehe, and Sori Brewing. The British influence extends to great fish 'n' chips. Open daily until 23:00 (or 02:00 at weekends) with Happy Hour all day Sunday, 16:00 - 19:00 Monday to Friday and before 16:00 on Saturday. Probably Tallinn's oldest tavern, with the building dating back to 1924, itself being built on the spot of a brewery which existed in 1832. The "Cattle Cellar" has gone through various changes since, most notably the shift in Soviet times when, as one of the only places in Tallinn to buy beer, queues would form down the street for the ales largely from Saaremaa Island. The bar closed in 1987 following Gorbachev's anti-alcohol campaign, finally returning in 1992 thanks to the Saku Brewery after the fall of the Iron Curtain. Today there are over 50 ales to choose from, six on tap, in a cellar pub-style environment with darts, live music and live football. 3 for 2 offers on beers help make it very busy in the evening so expect to be made to check your coat in. Open until 03:00 at weekends. Tallinn’s highest bar can be found at the top of the posh Swissôtel Tallinn, with views through the large windows far out over the Baltic Sea and the romantic medieval old town. Fantastic cocktails, an exclusive cigar lounge and a stylish interior make it the perfect place for romantic drinking or business meetings. Open until 01:00 every day.